Some of the finest vintage and antique dealers in the nation are headed to Tulsa Expo Square to present their wares at the Vintage Tulsa Show. 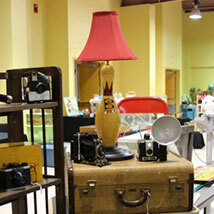 More than 55,000 square feet of merchandise will be set up at this show to the delight of antique and vintage lovers. Browse row after row of unique goods in a climate-controlled space with concessions available. From antique furniture and collectibles to vintage clothing and linens, find it all at the Vintage Tulsa Show.